If you want to charge your phone without being stuck by a power outlet, you don’t have many options. There’s the charging phone case mophie, of course. And there are charging mats, too, but your phone needs to be connected to the mat in order for it to charge. uBeam is a company that wants to change all that. It’s using ultrasound waves to wirelessly charge your phone. To make that a reality, the company just raised $US10 million in a Series A funding round led by Upfront Ventures with participation from Shawn Fanning, Mark Cuban, Troy Carter, Zappos’ Tony Hsieh, Yahoo’s Marissa Mayer, Ludlow Ventures, CrunchFund, Andreessen Horowitz, and Founders Fund, TechCrunch reports. 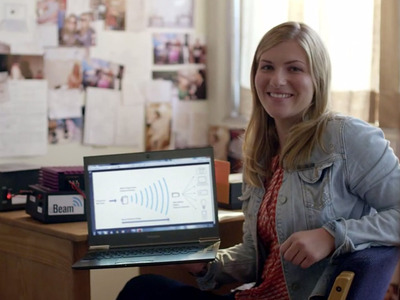 uBeam founder Meredith Perry came up with the idea for uBeam while she was still a student at the University of Pennsylvania. She showed up to class with a dead laptop and without a power cord, and was annoyed enough to think of a solution. Perry won an invention contest at Penn, and after graduating, she kept the uBeam momentum going. She raised $US1.7 million in seed funding from Ken Seiff, Marissa Mayer, Ellen Levy, Tony Hsieh, CrunchFund, and Andreessen Horowitz in 2012. After going into stealth mode for a while, the startup reemerged in August with an update about its first functional prototype. The technology behind uBeam is something that’s unprecedented. It converts electricity to inaudible sound waves, which travel through the air. The sound waves get converted back to electricity, which then charges up your devices. In order to work, the uBeam system needs a charger (which can be attached to a wall) and a receiver (which gets put on each device you want to charge). “We’ve developed a powerful and intelligent ultrasonic transmitter that beams high intensity ultrasound through the air,” Perry told Business Insider. The technology has one caveat: it can’t beam sound waves through walls. So if you’re buying a uBeam system for your house and you want to charge in every room, you’d have to buy a transmitter for each room in which you want to wirelessly charge your phone. The company is hoping to sell uBeam’s products to consumers by 2016. uBeam is making a version for homes and a more industrial version so you could wirelessly charge your phone in an airport or at a conference. It could become as ubiquitous as Wi-Fi. “If wireless power is everywhere, then the size of your battery can shrink because it’s always charging. You’ll never need a cord again, and you won’t need international charging adapters,” Perry told the New York Times in August.